Most of us want to have a own house. But Many of us do not have all funds which are required to buy a house. Here, a Home Loan can help us to buy a home which we can afford. We have to pay E.M.I every month in this kind of loan for 10 to 30 years. Again, there are different kinds home loan options available. Home Loan for Resident Indians. Loan for Repair and Extension of the house. There may be other variants too in Home Loans. 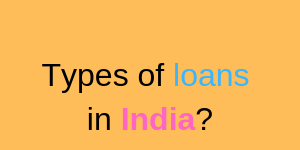 But I have mentioned basic home loan types above. Usually, people take this kind of loan to buy electronic gadgets, for sudden emergency issues etc. These kind of loans will have higher interest rates depending up on your occupation, income etc. Secured Loan- Here you have to provide some collateral to the Bank. Un-Secured Loan- In this type of no need of collateral. Parents can take this kind of loan for their children Higher Education Completion. You can take this kind of loan to buy your dream vehicle like Car and Bike. Usually this loan is a Secured loan and You need to collateral the vehicle to the lender. In case of loan amount not paid. Lender has the right to take the vehicle you bought. But some lenders may provide unsecured vehicle loan depending on your CIBIL Score. This loan will be process quickly. You will be provided loan up to 60% of the gold price. Here, in this loan your gold should be kept as collateral. Always be careful when you are putting your gold with NBFC’s for loan. The rate of interest is not constant among lenders. You can get loan from your endowment type of policies. In this loan, your insurance policy will be collateral to your loan. In case, you have not repaid the loan. Then the Insurance company will recover the loan from the maturity benefits of the policy. Usually, In this loan Life Insurance Companies will charge more interest than the interest that they are giving in the policy. Here the collateral in this loan Bank Fd it self. If you have a Fd of Rs.1,00,000, then Bank may give a loan of Rs.80,000. The interest rate will be more 1% or 2% more than the interest that you are getting from the Fd. You can get loan from your PPF OR EPF. But certain conditions will be there. There will be some lock in period before you get any loan. In EPF, you can get loan only for medical treatment, marriage, child higher education etc. Some lenders are providing loan against mutual fund units and shares. Lenders will give less loan for equity shares and equity mutual funds and higher amount of loan for debt mutual fund units. Here, Your shares and mutual fund units are collateral to the loan. These kind of Loans provided by Private lenders. The interest is as high as 30% to 100%. These kind of loans will spoil your financial health, and one day you will become poor. You should use these loans wisely. Paying more than 30% to 40% of your income as E.M.I is not advisable.